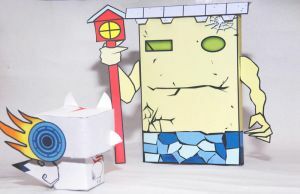 This paper toy is Blockhead grande, essentially immobile stone statue who’s only purpose in life is to block passages, based on the video game Okami, the paper model created by scarykurt. Blockheads claim never to attack first as it is brutish, their clan motto being “Take the beating, then dish it out! That is our clan’s philosophy!”.